February is a great time to visit Dubai, it’s one of the few months when you can enjoy the outdoors without dealing with the humidity or heat. It’s a time to enjoy roof top bars, Al fresco dining and other outdoor attractions throughout the city. Given this premise of outdoor “enjoyment”, the obvious question that befalls a would-be gentleman tourist is “what do I pack?”. Although that depends heavily on what you plan to do during your trip, you should find the below broad categories to be quite informative. 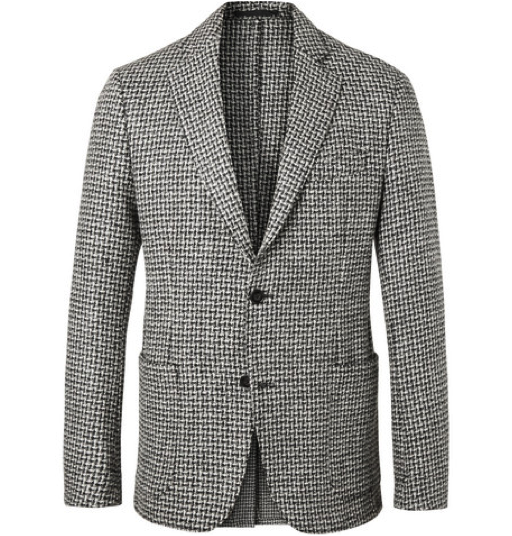 You’ve heard that suits crafted from cotton, linen or light weight wool are the go to pieces for Dubai. It’s true, for most of the year. In February the weather is significantly cooler, the temperature averages 26 degrees Celsius. You might want to seize this opportunity to wear a flannel suit while on business about town. A grey single-breasted piece is a good way to go. Grey, because it’s a solid color to build different work outfits on and you might not have the luxury to pack many suits. A solid color like grey always works well with a white shirt, all you have to do is vary the ties and pocket squares. A single-breasted piece is your best bet to travel with, they are easier to fold and take up less space when you pack. There are a lot of cool places to visit for leisure in February. In a way, we mean “cool” literally because restaurants typically offer outdoor dining. It can get a little bit chilly at such places, so it’s a great opportunity to wear a rollneck sweater. Rollneck sweaters are the perfect base to layer with an unstructured blazer. With or without the blazer, we definitely recommend packing one for your trip, preferably one that comes in baby cashmere. Not all outfits fall directly into the work or play category. Take scarves for instance, you might not want to wear them to a meeting. Outdoors, at the new Blue Waters Island though, you might welcome the comfort of a fine scarf wrapped around your neck. It can get quite chilly in the evenings. Our favorite in between piece is the overcoat. Typically, you wear one over your outfit and you have to take it off before you take a seat, otherwise it’s awkward. But we can all agree the cool points are worth it. We know you swear by your loafers, the penny and the tassel pair alike. We swear by ours too, ordinarily we would never leave home without all six of them, but February in Dubai isn’t the month to flash ankles. You would need monks, whole-cuts, Chelsea boots and cap-toes for this trip. We strongly recommend full length socks to go with these shoes, there will be a lot of time to flash ankles in the coming months, you can be sure of that. There you have it, a list of essential clothing items to pack for your February trip to Dubai. It’s important to mention this list is by no means exhaustive. Notice how it makes no mention of Pegase travel suit cases, or Bandouliere keep all bags from Louis Vuitton (even though they make for splendid travel companions). Our little list is intended to make sure you have the fundamental outfits you need to make the most stylish use of the weather.